Many of you may have realised from my web news stories that I am a lover of the more… ahem… unusual aspects of biology. 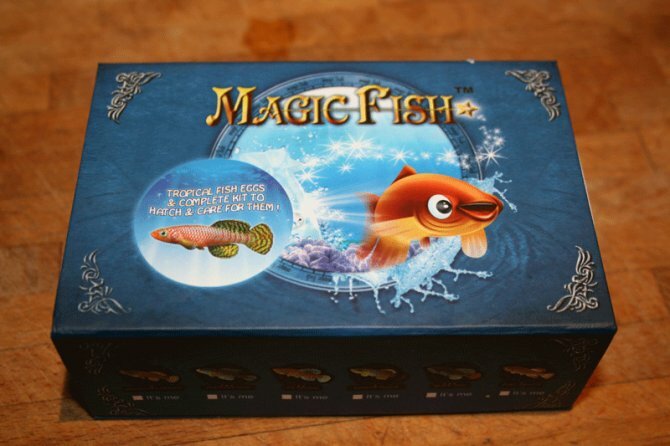 So when I was asked by PFK to review the Magic Fish Kit by Map Toys, to say the children and I were delighted would be an understatement. Ten long days later it finally arrived. 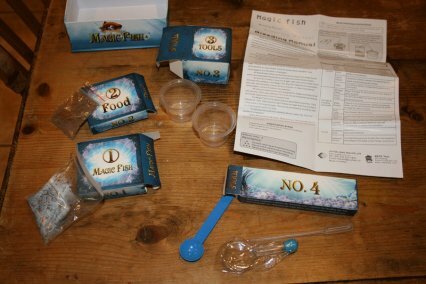 "a new science play kit suitable as a special educational gift for all occasions"
This science play kit is a box which contains two tiny plastic pots, a teabag which contains 'red-golden dragon fish' eggs, a bag of 'fairy seeds' and a box of tools. Before people start to panic, the tea bag does not in fact contain arowana eggs but actually 10 eggs of the Tanzanian killifish Nothobranchius korthausae. The 'fairy seeds' are in reality nothing more glamorous than brine shrimp. The idea is that anyone can hatch out their own killifish and feed them with their own brine shrimp. In the interest of science and nothing else I will be attempting to hatch them out. This kit has had some pretty shaky reviews on other websites so we’ll see how it goes. After leaving the tap water for 24 hours as instructed (to ensure the water is ‘free from chlorine’) in a container that is according to the instructions; at least 5cm/2in wide and 10cm/4in high (quite why they provide it with a container is 3cm x 3cm then I do not know) - in my case a, slightly unconventional, wine glass. I have now added my magic teabag. So far the fact that the eggs are in a coco substrate is very clear as there is nothing much to see other than a teabag and lots of brown floaty stuff. The instructions say that the first fish will hatch in anything from half an hour to 24 hours. For my sake I hope it is sooner rather than later or the children may kill me! Worried that that the water might not be quite up to the required temperature (15-35°), I moved it to a slightly warmer place. Thinking that we would wake in the morning to discover lots of tiny baby magic fish happily swimming round their wine glass, we were very disappointed to get up to find nothing but the coco substrate swimming. Will leave it another day but if still no sign of the splash of little fins, I may have to resort to Plan B. If they don’t hatch out the first time apparently you can dry out the tea bag for 10 -15 days and try again. I don’t know how patient they think children are but they obviously have never met mine. If it all goes quiet from me, you know that my children have mercilessly slaughtered me for a magic fish related disappointment! This week marked the end of the 10 day wait. I was actually quite optimistic when I put the little tea bag in a new wine glass of water; the children however had by this time lost all interest and weren’t even bothered about watching it go back in. Two days later and I’m sad to report that their pessimism was well founded. Still no sign of little fish and I think I’m going to have to give it up as a bad job.